Hello and welcome, yes, I know, i haven't been updating for over 2 months now, sorry about that, there's a lot of IRL problem for me right now. But don't worry, i have a few post coming this month, starting with this one. So, something very incredible just came out a few days ago, Nogizaka46 has just release the Music Video for their 20th single "Synchronicity", and oh my god its amazing. I think that it is the best dance performance MV out of any 48/46 group ever, hell i say it has the best choreography out of any 48/46 group song (certainly the best in recent time *cough* Teacher Teacher *cough*). anyway, i say this choreography is the best because of the story that it has, and i don't mean by story like "its a song about a couple" or "the movement in the chorus is inspired by the gesture of making Onigiri". No, what i mean by story is that every movement from start to finish tells a complete narrative story. and as someone who has some experience in dancing, what i'm trying to do in this post is to try to tell the story within the Synchronicity choreography. first a little bit of background of the choreo itself, the Synchronicity choreography was made by Seishiro-san, the same guy who did the choreography for Influencer, known for his very fast and complex hand gesture, which can be seen in both Influencer and Synchronicity (and his other stuff). Anyway, onward to the story itself. we start with a solo part from Maiyan looking very sad, and lonely. the story here is that the main protagonist (Maiyan) is being left by someone important to her (which you will see later that it is Ikoma). she feels really sad and lonely, and thinks that the whole world is now against her and that she is alone. 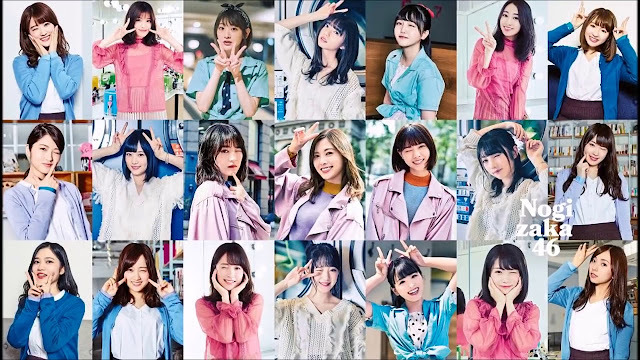 now, in the first part of the song you will see that the members play the role as passers-by, people minding their own stuff with their own problem, shown by the confusion on Maiyan's expression and the fact that the first part of the song until the first chorus the member are not synchronize at all, everyone is doing their own thing with their own problem. this bit tell the story of Maiyan being lost and don't know what to do, everyone around her is ignoring her, she has no one to talk to. she is lost, and desperate for an answer to her problem. the first picture shows the sadness, the second shows the confusion with Maiyan running in a clockwise direction while the others running in an anti-clockwise direction. 4 members step up, the captain Sakurai Reika and the 3 member that have the closest relationship with Maiyan, Eto Misa, Matsumura Sayuri and Akimoto Manatsu (if this is a coincidence then it is an amazing coincidence) and finishing off with this scene where Ikoma basically say "Its going to be alright"
she's still alone and started to feel lonely again. then we get to the climax of the story, where everyone huddles around a sad and lonely Maiyan saying "its alright, we're here with you and for you. you can throw all the sadness to us and we will help and support you." this is probably the most touching part of the MV. i just want to show this picture because its great, there's one part where they suddenly focus to Ikoma which i really like. and we are at the end, i hope i can make up for my absence with this post. i have a few more coming, one of them being the prediction for the AKB48 53rd single senbatsu sousenkyo and the other is of course the full review of the Synchronicity single. I finally finished reading Dava! Thank you so much for telling this. You did a great job and I would say that without watching the MV, one would totally understand the "story" of it all. You describe it perfectly and with great detail that really does not downplay the song. I agree with you that this song has a great story with a wonderful meaning behind it. Like you said, it is a great send off for Ikoma. And some great "final" moments between Maiyan and Ikoma. The mv and the imagery is very serene, very graceful and really beautiful. It really is nothing we have seen this year, by any group. While I usually don't let the story of the dance influence me or other contemporary dances, this really is something I can watch and get behind. The elegant, impactful, soft, serene and graceful dance of Nogi is something I don't think Keya can pull off. AKB may be able to pull it off. That may be wishful thinking though, or bias. is a concept, first introduced by analytical psychologist Carl Jung, which holds that events are "meaningful coincidences" if they occur with no causal relationship yet seem to be meaningfully related. During his career, Jung furnished several different definitions of it. Jung defined synchronicity as an "acausal connecting (togetherness) principle," "meaningful coincidence", and "acausal parallelism." This song is love at first sight (or hear), its just so cute, very fun and youthful. amazing considering that its sung by some of the oldest in the group at that time. i guess age doesn't dictate how cute somebody is, because all 5 members (Shiraishi Mai, Fukagawa Mai, Hashimoto Nanami, Takayama Kazumi, Matsumura Sayuri) sound very cute, and looks very cute as well in the MV.